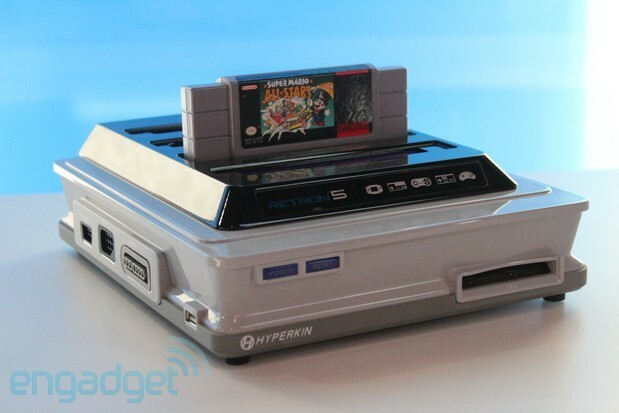 News of the Retron 5 first surfaced in March of this year and it looks as though the all-in-one home console is nearly ready for primetime. The recent listing on amazon.com pegs the machine at $100 with a December 2013 release date, a little later than it’s scheduled summer date. Information on the device is still hard to come by, but it looks like it may be running on Android this time, presumably using the vast array of available emulators to accomplish its goal. It’s goal of course, is to consolidate a bunch of old consoles into one neat and tidy box. The machine accepts cartridges from NES, SNES, Genesis, Famicom, Game Boy Advance, Super Famicom, Mega Drive, Game Boy Color and Game Boy. It allows for use of the original controllers, and even allows you to use your favourite controller to play games from any other system. Specifics on the hardware are still non-existant, so we’ll have to wait a little longer to find out for sure whether Android really is the OS for this device, and in the meantime you can cast your eyes over Hyperkin’s old announcement and more recent update at their website. Engadget also did a hands on in June, which you can read here. It’s definitly not using Android. It’s not a machine running emulators, it’s most likely somehting based around one or more FPGA or something close to that.